I realize I’m a little late to the party but I had to write a few words about Birds of Prey, the short-lived TV series from 2002. I checked out the first few episodes over the weekend courtesy of Netflix after learning that my childhood playmate Dina Meyer starred in it as Batgirl. I hoped to discover it was kid-friendly and that I could show it to Jonah and Archer and then boast to them that I knew Batgirl. Unfortunately, when Dina assured me it was kid-friendly, she must have meant young-adult friendly. Or maybe she just meant that it’s more kid-friendly than the Saw films, in which she also stars. At any rate it wasn’t age-appropriate for a four- and a six-year-old. But that’s not the only reason I wouldn’t show it to them. Nothing against my friend from the old neighborhood, who did a fine job with what she had to work with, but I have some serious problems with the show’s premise. Birds of Prey takes place in the city of New Gotham, some years after a cataclysmic confrontation between Batman and The Joker. The Joker lost, but on his way out of town he murdered Catwoman — Batman’s true love — and attempted to kill Barbara Gordon, a.k.a. 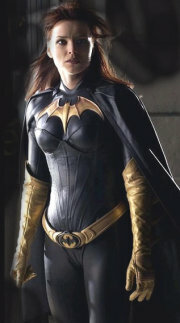 Batgirl, Batman’s protégé. Barbara survived, paralyzed below the waist. Batman vanished from New Gotham, apparently driven to despair by the Joker’s targeting of the the two women closest to him. Under the new alias Oracle, Barbara Gordon presides over a super-high-tech crime-fighting lab from which she supervises The Huntress, a heroine with Matrix-style superpowers of combat and wardrobe and who, by the way, is the secret love child of Batman and Catwoman. Together, with the help of a third babe with mental superpowers who joins their team, they battle a variety of supernatural foes stalking New Gotham, most of them under the direction of the scheming Dr. Harleen Quinzel, once The Joker’s groupie and now a respected, unsuspected mental-health professional and director of Arkham Asylum. Batman has a daughter he doesn’t know about? With Catwoman? Well, I might be able to buy the with-Catwoman part — maybe (mustn’t their love remain unconsummated because she chose the wrong side of the law?) — but considering the importance of Batman’s own parents to his mythos, it’s tone-deaf to make him a daddy too and then make him (a) unaware and (b) absent. Speaking of which, Batman’s gone? What about the terrible graveside vow he made to his parents? He just broke it? What, does he think crime in New Gotham is over now that The Joker is defeated? I’m sorry, but Batman would never simply up and leave town, I don’t care how much he has suffered — especially with Barbara Gordon still alive and still fighting crime despite suffering even more directly than Batman from The Joker’s attack. Supposedly Batman dealt The Joker some sort of total final defeat. What kind of “final defeat” leaves The Joker free to murder Catwoman, cripple Batgirl, and then skip town? And where did The Joker go after leaving New Gotham? Back to those parting shots from The Joker. His attacks are mere executions. There’s nothing Joker-like about them. We actually get to see the attack on Batgirl. He knocks on her apartment door and shoots her point-blank when she opens it. With a handgun, one that shoots bullets, not a telescoping boxing glove. He doesn’t blow up her apartment. He doesn’t drive a wrecking ball into the side of her building. Where’s the jack-in-the-box spraying poison gas? Where’s the robot clown with spinning razors for hands? Where’s the sadistic glee, the cackling laughter? If he was capable of this kind of attack before, why did he wait until he was “defeated”? And how did this master criminal get the drop on Batgirl and merely cripple her, not kill her? And why in the world would crimefighter Barbara Gordon, daughter of the police commissioner, simply open her apartment door to The Joker? Speaking of, where is Commissioner Gordon? He’s never mentioned. About Dr. Quinzel: how did The Joker’s kooky moll become a professional psychiatrist, administrator, and evil mastermind? “Harley Quinn” is flighty and ditzy, the very opposite of the restrained, duplicitous, organized schemer she’s portrayed to be here. Judging from other incarnations of her character, she should be doing no more or less than constantly searching for The Joker and looking for ways to bring him back to New Gotham. I could let all of those other problems slide if it weren’t for the thing that bothers me about The Huntress: she has superpowers. Why would the daughter of Batman and Catwoman have superpowers? Why would anyone in Gotham (sorry: New Gotham) have superpowers? The Batman universe is appealing largely because there are no superpowers. Yes, I’m aware of Superman/Batman crossover stories, and that you can’t have staple Batman comic-book villains like Clayface without superpowers; but my Batman universe — the one on TV and in movies — has mostly stayed away from the supernatural. I like the idea that with nothing more than a bottomless pile of cash, a preternaturally capable manservant, and a will of iron, I could be Batman. 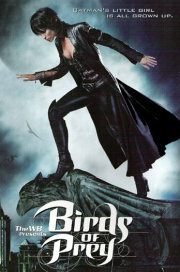 Finally: isn’t it a little sexist to call a show about three hot chicks Birds of Prey? Oh well. Someday Jonah and Archer will get to make up their own minds about it. But consistent storytelling matters to me. I’d almost rather they see Saw first. Previous PostPrevious Couldn’t I be a little less right all the time?